Stroke definition and statistics: An updated definition of ischaemic stroke by the American Stroke Association is ‘an episode of neurological dysfunction caused by focal cerebral, spinal, or retinal infarction’ where infarction is ‘cell death due to ischaemia’ and is evidenced either pathologically or by clinical symptoms lasting longer than 24 hours . Almost 152,000 strokes occur per year in the UK, of which the majority (85%) is of ischaemic origin . This means that every three and a half minutes, someone in the UK suffers a stroke, and almost half of these people are left with a life changing disability . It is the fourth biggest cause of death in the UK and the second leading cause worldwide . As a result, there is a massive economic burden of stroke on society and the NHS. It is estimated that stroke costs our society £9 billion a year; this includes stroke treatment and rehabilitation as well as the loss in workforce and productivity . Stroke treatment consumes 5% of the entire NHS treatment costs and an astonishing 50% of the total direct care costs (i.e. diagnosis, inpatient and outpatient care) . Our brain has a very high metabolic rate; it consumes 20% of our total oxygen supply and requires 15% of our cardiac output . Neurons do not store energy in the form of glycogen like other tissue cells therefore they rely completely on a constant supply of glucose and oxygen provided by cerebral blood flow (CBF) for its metabolic demands . Anything which grossly disrupts this supply can cause hypoxia, ischaemia and if severe or prolonged, can result in irreversible infarction. Normal CBF to grey matter is approximately 100 ml/100 g/ min; this is well controlled by cerebral perfusion pressure (CPP) and cerebral vascular resistance (CVR) . If CBF falls to 0 ml/100 mg/min, irreversible cerebral infarction occurs in 4-10 mins, this is prolonged to 1 hour is CBF is between 16-18 ml/100 mg/min . However, if CBF is maintained above 20 ml/100 mg/min, reversible ischaemia without infarction takes place . Factors that disrupt CPP or CVR can result in an ischaemic stroke. Generally there are two types of ischaemia; global and focal . Global ischaemia results from a drop in CPP due to a decline in systolic blood pressure to below 50 mmHg, such as in severe hypotension, shock or cardiac arrest; this results in extensive brain injury . However, in strokes cases, we typically see focal ischaemia, due to an increase in CVR from atherosclerosis and thromboembolisms . Once cerebral blood flow is occluded, many processes take place leading to ischaemia. A lack of glucose and oxygen stops production of ATP that is needed for active transport across ion channels, therefore, an intracellular influx of sodium and calcium ions occurs [7,8]. This triggers several reactions including intracellular proteolysis, excessive release of glutamate across synapses resulting in neurotoxicity, and production of prostaglandins and free radicals, all of which lead to neuronal damage and necrosis [7,8]. The main causes of focal ischaemic stroke relate to ‘Virchows triad’ of thrombus formation, which states that a thromboembolism occurs when any one of these three factors exist; endothelial damage (e.g. by hypertension), abnormal blood flow (including blood stasis or turbulent flow, e.g. by atheromatous plaque), and blood hypercoaguablilty . We can classify these pathological factors into the following causes as summarised in the table below (Table 1). Ischaemic stroke can be classified clinically using the Bamford/Oxford Stroke Classification (Table 2) [9-11]. This splits stroke up into syndromes based on clinical signs and symptoms from which we can predict the location of the insult and vessel territory as well as the extent and prognosis of the ischaemia . Table 2: Literature search results. Ischaemic stroke is clinically diagnosed using the clinical features mentioned above. Imaging techniques e.g. CT or MRI scans are carried out to confirm this diagnosis and exclude haemorrhage and other causes. Further tools are used to assess extent of stroke, such as the NIHSS (National Institute of Health Stroke Scale) and mRS (Modified Rankin Score). The NIHSS is done at baseline and throughout hospital stay to determine the severity of stroke and prognosis . The mRS determines the effect of the stroke on a patient’s functioning, i.e. the degree of disability . The current management pathway set out by NICE and the Royal college of Physicians for acute stroke is summarized in the Figure 1 [14,15]. Figure 1: The current management pathway set out by NICE and the Royal college of Physicians for acute stroke. • Indications for thrombolysis or early anticoagulation treatment. • A known bleeding tendency. • A depressed level of consciousness (Glasgow Coma Score below 13). • Unexplained progressive or fluctuating symptoms. • Papilloedema, neck stiffness or fever. • Severe headache at onset of stroke symptoms. Invasive endovascular intervention, such as Thrombectomy, are also available, however, their use is not well promoted in the stroke guidelines and is only considered in the context of research or if IVT (intravenous thrombolysis) has failed or is unsuitable . Due to the time delay and haemorrhagic complications of IVT use, thrombectomy was developed and approved in 2004 as an alternative or adjunctive treatment . There are several devices for endovascular intervention including coil retrievers, vacuum aspiration (Penumbra system) and stent retrievers. Stent retrievers were approved in 2012 and are the most widely used device, with the newest generation of ‘Solitaire’ Stent Retrievers preferred due to lower risk of complications and greater efficacy . The actual procedure involves inserting a guidewire, balloon catheter and stent retriever through the femoral artery to the occluded vessel. Once the stent retriever is deployed under angiographic imaging, the thrombus is trapped, aspirated and removed . Thrombectomy works best for large or proximal vessel occlusions . The aim puncture-to-perfusion time of < 1h hour and should be done within 90 mins after IVT . Complications of thrombectomy include, symptomatic intracranial haemorrhage (SICH) (2-4%), distal emboli (2%), arterial dissection (1%), vessel perforation (1%) and access site complications (e.g. groin infection or haemorrhage (1%)) [17,20]. These risks are much lower than those for IVT alone and become even lower, as the device technology develops. In summary, thrombectomy is a rapidly developing field within stroke management. There are numerous trials researching its efficacy compared to IVT alone or as an adjunct. The interest in thrombectomy is rising with the opinion that it could soon replace IVT altogether, therefore, it is imperative that this should be matched by a clear and comprehensive guidance in the UK . To compare and critically analyse the current UK and European guidelines on thrombectomy use in order to create a new and updated guideline proposal. 1. To compare UK and European guidance on thrombectomy. 2. To analyze and discuss the evidence-based and limitations of the current recommendations. 3. To suggest proposal for best practice. Currently, there are two main evidence based recommendations for mechanical clot retrieval: UK NICE guidance, ‘Mechanical clot retrieval for treating acute ischaemic stroke’, July 2013, and a ‘Consensus statement on mechanical thrombectomy in acute ischaemic stroke’ by the ESO (European Stroke Association), which was last updated in February 2015 [19,20]. NICE’s criteria is very vague and restricts the use of thrombectomy as a last resort therapy, probably due to its ‘unproven efficacy’. It also fails to explain the definition of ‘suitable’ and ‘unsuitable’, and as a result, makes the guidance difficult to follow in clinical practice, especially in emergency stroke situations  (Table 3). Indications Patients in whom thrombolysis is unsuitable. Patients in whom thrombolysis has failed. For those whom thrombolysis is suitable, thrombectomy can only be carried out for research purposes in the form of clinical trials. Patients with acute ischaemic stroke who have had IVT within 4.5 hours, with large artery occlusion, in the anterior circulation or basilar artery, presenting <6 hours after symptom onset. Table 3: Selection criteria for thrombectomy. ESO guidance, on the other hand, has very clear outlines. It allows for a 6 hour time window from onset to reperfusion as evidenced by the MR CLEAN trial, which found that treatment was not effective after 6 hrs 19 mins . Only patients with anterior circulation (including ICA, M1, M2 segment of MCA) and basilar occlusions are indicated because these patients are the only cases studied in the main trials [17,22-26]. Large vessel occlusion is indicated due to the fact that clot retrieval is only effective in large and proximal arteries due to the size of the device . ESO makes it clear on how to identify large vessel occlusion, using CT-angiography, or if not available, an NIHSS >9 (within 3 hours from onset) or >7 (between 3-6 hours post-onset) [19,27,28]. An ASPECT score 0-4 is contraindicated for the reason that evidence from MR CLEAN has shown that thrombectomy is only beneficial with ASPECT scores 5-10, not where there is extensive ischaemia [19,22]. NICE does not explain how patients should be selected, only that it should be done by a stroke specialist clinician . ESO recommends that patients should be selected on diagnosis of a large vessel occlusion using non-invasive imaging (e.g. CTangiography) or on a high NIHSS score (>9 if within 3 hours from onset, or >7 between 3-6 hours post-onset), with an ASPECTS score >519. Patients should be selected by an MDT of a stroke physician and a neurointerventionalist . ESO’s detailed guidance ensures that the correct patients are selected by the most experienced team so that thrombectomy has the best chance for success with the lowest risk of harm. Both guidelines suggest that thrombectomy should be carried out using a ‘stent retriever’ by a neurointerventionalist and the patient should be under local or general anaesthaesia, depending on the patient. NICE believe that the ‘efficacy is unproven’ for thrombectomy usage in acute ischaemic stroke, however, ESO supports the use of thrombectomy and states that there is ‘very good evidence for early thrombectomy [9,20]. This conclusion, by NICE that thrombectomy is ineffective, is based on results from studies that showed low thrombectomy recanalisation rates ( 41%), lack of significant improvement in functionality using mRS in thrombectomy compared to IVT alone, and similar mortality rates in those treated with thrombectomy alone versus thrombectomy as an adjunct to IVT (24% and 18% respectively) [20,29-31]. • EXTEND-IA, a trial that looked at the reperfusion rates of intra-arterial clot retrieval after IVT compared to IVT alone, found reperfusion rate at 24 hours to be 100% (thrombectomy) compared to 37% (IVT alone), and a NNT of 3 to obtain mRS 0-2 at 90 days by thrombectomy (mRS of 0-2 at 90 days: 71% intervention group, 40% control group) . • The ESCAPE trial compared rates of functional outcomes (mRS 0-2, NIHSS) and mortality in the intervention (thrombectomy + IVT) and control (IVT alone) groups. It found a large drop from baseline NIHSS of 16 to 6 at 24 hours in the intervention group. The control group did not improve as drastically (17 baseline to 13 at 24 hours) . Both groups shifted from the category of ‘moderate-severe stroke’ to ‘moderate stoke’, however the thrombectomy group regained far more functionally, almost to a ‘minor stroke’ category [24,33]. • SWIFT PRIME, a trial with the aim of comparing long-term functional outcome at 90 days in intervention (thrombectomy + IVT) and control (IVT alone) groups. It found that although the mortality rate was not significantly lower 9% (intervention) versus 12% (control), the 90-day functional independence was much higher (60% intervention vs. 35% control) . • In terms of safety, there is a reduction in mortality rates with thrombectomy across all four trials but only ESCAPE shows it to be statistically significant 10.4% (intervention) versus 19% (control) . The primary outcome used for assessing efficacy is mRS score at 90 days. Table 4 provides an example of the disparity between results from evidence used by NICE and ESO to support their different views on efficacy and hence the guidance. Table 4 : An example of the disparity between results from evidence used by NICE and ESO to support their different views on efficacy and hence guidance. The difference in these specific findings may be due to limitations of the IMS III trial, for example, the unequal assigning of patients into intervention and control group using a 2:1 ratio, lack of standardization in the use of endovascular device and technique as well as a higher baseline mRS in the intervention group. The MR CLEAN trial seems to be more reliable as it lacks these limitations and its results are supported by other robust trials. As a whole, ESO recommendations seem much more robust as evidenced by the fact that its findings are from the most recent (2015) studies, all of which are randomised controlled trials, using the same stent retriever device with large sample sizes (e.g. 500 patients in MR CLEAN). In comparison, NICE uses a mixture of less reliable studies including meta-analysis, RCTs and case series, all of which are relatively old (ranging from 2011 to 2013) and use a range of different devices, all with different efficacy and safety rates [29-31]. 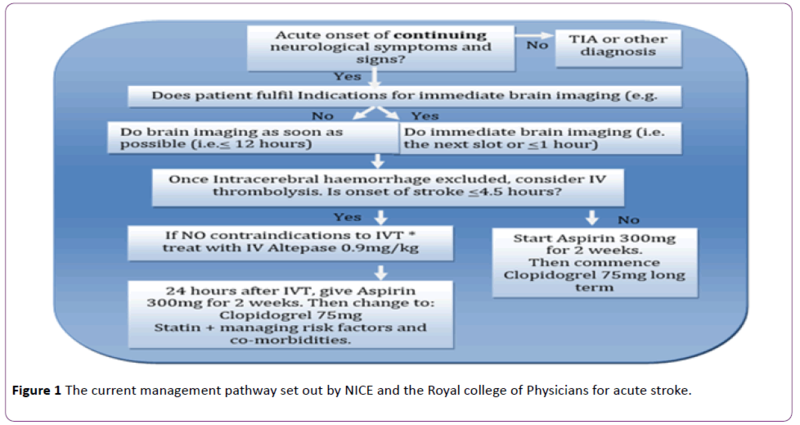 The following suggested guidelines (Figure 2) have been created using current guidance from NICE and ESO, the evidence cited and the current thrombectomy protocol from the Walton Centre [19,20,35-37]. Figure 2: New guideline proposals for best practice. A CTA and baseline NIHSS has been included in the initial stroke investigation so that large vessel occlusion can be identified as early as possible and a thrombectomy indicated and performed sooner to reduce mRS and risk of complications. However, this may delay the administration of IVT and lead to further ischaemic damage, which may lower the ASPECT score and contraindicating thrombectomy. ESO recommendations state ‘mechanical thrombectomy should not prevent the initiation of IVT where it is indicated, and IVT should not delay mechanical thrombectomy’ . This is a difficult to implement practically because currently thrombectomy is only used after IVT is administered, however thrombectomy is indicated with a large vessel occlusion only and this needs to be investigated initially before the clot is thrombolysed. In summary, there is very little guidance in the UK for thrombectomy use in ischaemic stroke as evidenced by NICE guidance, which is vague, restrictive and based on older, smaller and less robust studies. ESO, on the other hand, uses stronger, more recent data to support its comprehensive guidance. The UK needs to update its guidelines in accordance to the new literature available and current European practice, both of which are incorporated into the proposed guideline. Furthermore, research needs to be carried out into the use of thrombectomy alone in large vessel strokes versus combination therapy (IVT + thrombectomy) as it can free up a great amount of time and financial resources. With the growing evidence to support thrombectomy, and the limitations of IVT therapy, it seems that we are headed towards a future lead by advances in interventional radiology; we can only hope that the UK based guidelines and practices can catch up with the European and international community on stroke management. Sacco RL (2013) An updated definition of stroke for the 21st Century. American Heart Association 44: 2064-2089. Townsend N (2012) Coronary heart disease statistics. British Heart Foundation, London. Stroke Association (2015) State of the Nation Stroke Statistics. Saka O, McGuire A, Wolfe C (2009) Cost of stroke in the UK. Age and Ageing 38: 27-32. Kumar V, Abbas AK, Aster JC (2012) Robbins basic pathology. 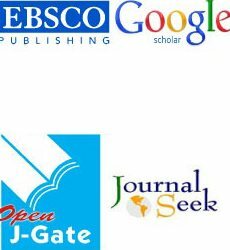 Canada: Elsevier Saudners 2012: 814-816. Lindsay KW, Bone I (2004) Neurology and Neurosurgery Illustrated. London: Churchill Livington 2004: 238-243. Bamford JM (2000) The role of the clinical examination in the sub-classification of stroke. Cardiovascular Diseases10: 2-4. Raithatha A, Pratt G, Rash A (2013) Developments in the managemnt of acute ischaemic stroke. Continuing education in anaesthia. Critical Care and Pain 13:80-86. Merwick A, Werring D (2014) Posterior circulation ischaemic stroke-Clinical review. BMJ pp: 348. National Institute of Health (2015) National Institute of Neurological Disorders and Stroke. Stroke Scale. Runde D (2015) Modified Rankin Scale for neurologic disability. mRS-9QMDcalculator.Retrieved on 17-02-2015. Intercollegiate Stroke Working Party (2012) National clinical guideline for stroke, (4thedn). London: Royal College of Physicians.p: 1-232. NICE(2008) Stroke:Diagnosis and initial management of acute stroke and transient ischaemic attack (TIA). p: 1-29. Raychev R, Saver JL (2012) Mechanical thrombectomy devices for treatment of stroke. NeurolClinPract2: 231–235. Rohde S, Bösel J, Hacke W, Bendszus M (2012) Stent retriever technology: Concept, application and initial results. J NeuroInterventSurg 4:455-458. ESO, ESMINT, ESNR, ESO-Karolinska Stroke Update (2014):A Consensus statement on mechanical thrombectomy.European Stroke Organization. NICE (2013) Mechanical clot retrieval for treating acute ischaemic stroke. NICE interventional procedureguidance 548. Sekhar A (2015) Intra-arterial treatment in acute ischaemic stroke: What we learn from the MR CLEAN trial’. Journal of Royal College of Physicians of Edinburgh45:43-44. Berkhemer OA (2015) A randomized trial of intraarterial treatment for acute ischemic stroke. N Engl J Med 372:11-20. Campbell BC (2015) Endovascular therapy for ischemic stroke with perfusion-imaging selection. N Engl J Med372: 1009-1018. Goyal M (2015) Randomized assessment of rapid endovascular treatment of ischemic stroke. N Engl J Med 372: 1019-1030. Saver JL (2015) Stent-Retriever Thrombectomy after Intravenous t-PA vs. t-PA Alone in Stroke. N Engl J Med372:2285-2295. Kumar G, Shahripour RB, Alexandrov AV (2014) Recanalization of acute basilar artery occlusion improves outcomes: A meta-analysis. J NeurointervSurg7(12):868-874. Cooray C, Fekete K, Mikulik R, Lees KR, Wahlgren N, et al. (2015) Threshold for NIH stroke scale in predicting vessel occlusion and functional outcome after stroke thrombolysis. Official Journal of the International Stroke Society.Int J Stroke10:822-829. Rouchaud A, Mazighi M, Labreuche J (2011) Outcomes of mechanical endovascular therapy for acute ischemic stroke: a clinical registry study and systematic review. Stroke42: 1289–1294. Broderick JP, Palesch YY, Demchuk AM, Yeatts SD (2013) Endovascular therapy after intravenous t-PA versus t-PA alone for stroke. N Engl J Med 368:893-903. Dávalos A, Pereira VM, Chapot R (2012) Retrospective multicenter study of solitaire FR for revascularization in the treatment of acute ischemic stroke. Stroke43: 2699–2705. Rankin J (1957) Cerebral vascular accidents in patients over the age of 60. Scott Med J 2:200-15. VerHage A (2011) The NIH stroke scale: a window into neurological status. Nurse.Com Nursing Spectrum24:44-49. Sekhar A, Fletcher NA (2015) Guidelines of thrombectomy in large vessel occlusive stroke at the Walton Centre NHS Foundation Trust. McDonald JS, Brinjikji W, Rabinstein AA, Cloft HJ, Lanzino G, et al. (2015) Conscious sedation versus general anaesthesia during mechanical thrombectomy for stroke: A propensity score analysis.J NeurointervSurg7:789-794. Behme D, Gondecki L, Fiethen S, Kowoll A, Mpotsaris A, et al. (2014) Complications of mechanical thrombectomy for acute ischemic stroke-a retrospective single-center study of 176 consecutive cases. Neuroradiology56:467-476.